Read our customers' honest and impartial Vauxhall Corsa car reviews and ratings to easily find your next car at Motorparks. Had the car 2 weeks and love it. Tons of kit, easy to drive, economical and otherwise cheap to run. Small note, if you do a lot of motorway miles it is only 5 gears so can get a little bit more boomy at high speeds, but I generally cruise at 60 mph and enjoy the fuel economy. I love our new car....just finished washing it.....it looks brand new.....goes so well.....very happy so far! I really love this car. It was great to be able to test drive an automatic before buying as one was available on the day. I have now had the car nine months and am very pleased with the comfort and helpful features of the car. My lights are set on auto, as are the window screen wipers, the seat and steering wheel heat up quickly which is great on a cold morning and the car is great fun to drive, which I didn't expect from an automatic. The only thing I'm not keen on is the annoying beep of the distance sensor which is distracting, although you can turn it off. Will have a hard job giving up this car when it's time to update it. The staff at the showroom were really helpful and I left with a car which met my needs as I have difficulty with both my knees and a bad back! I recently upgraded my 2013 1.2 Energy Corsa to a 1.4 and immediately noticed the difference in performance. I am very happy - not only with the horsepower - but also all the new extras and additions - Auto lighting, intelligent wipers, heated seats and steering wheel, as well as the modern fascia and communications facilities. Glad I made the move - Thanks Doves for the deal and Vauxhall for the technology. Nice car, easy to drive, comfortable, and I like all the little added touches like the heated seats etc. Only issue I occasionally have is with electronics - sometimes it feels like there is a bit too much going when I try to quickly find something I haven't used yet. Very practical, good space, nice and smooth runner - would tell everyone to try one out. Very helpful staff at County Motor Works too. I am delighted with my Vauxhall Corsa. It is smart, easy to drive and comfortable. It's automatic with cruise control which is great. This is our third Vauxhall car. The first two were Vauxhall Astra. I only looked at two other cars and decided this was the for me. The car I picked this time was a Corsa and love it. Very pleased with the Corsa. Lovely looking car inside and out and drives very smoothly. Very happy and it makes driving a pleasure. I have really enjoyed driving my new car. It looks good and is very comfortable. The interior is well presented and it had lots of good gadgets. Lovely car works perfectly, couldn't have asked for a better first car. Very pleased with my new Corsa. Drives well and on board tech is great. Made the most of bluetooth and intetnet hotspot. Updated with lots of improvements and great to drive. I love my new Corsa! It's zippy, comfortable and for the price, a very high spec. As an older female driver, reliability is crucial for my peace of mind and this car delivers. Beautiful to drive - very pleased. Loving my Vauxhall Corsa 1.4 SE - for me, it's the car to have - it has it all. Everything fine runningwise. Only disappointments are that because of the small rear side windows, reversing is more difficult than in the previous Vauxhall that I had. Also, rear seat passengers I recently took away were struggling to get in and out of the car. After over 50 years of driving manual cars I have found, after a short familiarisation period, that the Corsa Automatic Energy is extremely easy to drive. The automatic lights, parking sensors front and rear and the electric adjustment of the wing mirrors are of a great benefit too, as are the demisting and defrosting of the windscreen and rear window - both very quick. The heated front seats and steering wheel exude a feeling of luxury. The information centre is well laid out and very informative in its messages. The Infotainment system is quite comprehensive although I have not yet got to grips with all its features in what it provides - radio, Bluetooth or cable for connecting external storage devices, a navigation system and the safe use of a smartphone and its Apps. The system can be used easily with either touch screen or buttons on the steering wheel. Of the car itself, the inside trim and external finish are both smart and to a high standard. Overall, it is a car that I am pleased with and would recommend to anyone. The car is everything and more. I do on average about 90 miles a day this car is very comfortable to drive. I am a summer girl but I am looking forward to the winter this year my new car has heated seats and steering wheel no more blue fingers and waiting for hands to heat up before leaving. 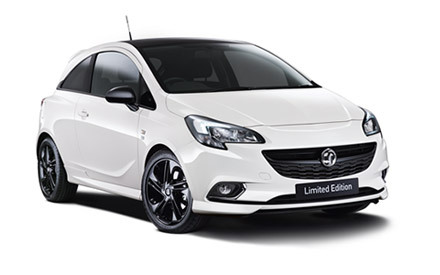 The Corsa is a pleasure to drive and has many comfort and safety features. This is our second Corsa, the first being an 'Elite'. The 'Energy' has the more-powerful engine which is better for our trips to the Yorkshire Dales. My wife is also delightesd with the car which she will probably drive more as we are now in our 80's. Enjoying my new Griffin. The front sport seats and firm suspension make this a very comfortable ride. I love my vauxhall corsa, the car is smooth, looks great and gives the impression of bigger car.